Indie Plexifilm has announced their debut high-def release, bringing the documentary 'Helvetica' to Blu-ray this May in standard and deluxe editions. 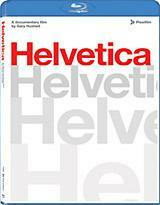 Filmed entirely in high-definition, 'Helvetica' is the widely-acclaimed documentary about typography, graphic design, and global visual culture. The film that looks at the proliferation of one typeface as part of a larger conversation about the way type affects our lives. Marking Plexifilm's first next-gen release, the distributor will release 'Helvetica' on May 6 (day-and-date with the standard DVD) in both a standard version and a strictly Limited Edition with collectible packaging. Disc contents are identical on both versions, featuring 98 minutes of additional interviews, plus a full-color booklet. Tech specs include 1080p video and Dolby Digital 5.1 Surround audio, plus English and German subtitles. The Limited Edition is conceived and designed by Dutch design team Experimental Jetset, and includes a 12-inch gatefold record cover housing a four-panel Blu-ray disc insert in one side and a fold-out poster in the other. The entire package (strictly limited to a run of 1,500 copies only) comes in a custom black cloth record bag, and is signed by the film's director Gary Hutswith. Retail for the standard Blu-ray is $26.00, and $125.00 for the Limited Edition. You'll find specs for 'Helvetica' and the 'Helvetica (Limited Edition)' linked from our Blu-ray Release Schedule, where they're indexed under May 6. We've also set up a dedicated thread for Plexifilm's latest in our Forums area -- click the following link to discuss the 'Helvetica' Blu-ray release.